Established in 2010 (License# 50-174), we are a small, family-run Grade A Goat Dairy and Creamery. Our cheese has been sold at Farmer’s Markets and retail stores since 2011. Midnight Goat Farm is the only commercial “hand milking” dairy in Vermont. 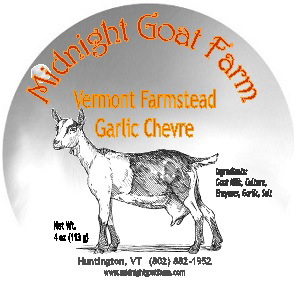 Our wonderful, pasture-fed French Alpine goats provide us with extra-ordinarily delicious milk with which we produce our handcrafted raw artisan farmstead Chevre in micro-batches. We currently produce three flavors of aged raw Cheve in our Net zero facility. Our ingredients are all natural and GMO free. We use no fillers, preservatives, hormones, robots or machines of any kind. We are not certified organic, but practice at or above most organic standards. We age our raw milk Chevre for least 60 days under the watchful eye of our partners the Vermont Department of Agriculture Food & Markets Dairy Section. Our Chevre costs more to make on account of ageing facilities and labor, but we think it is worth it to provide the unique taste and texture and health benefits of our cheese. Our convenient, re-sealable, poly containers are made in the USA and sourced in Vermont. Each container is hand packed, inspected and tamper resistant sealed by a caring Vermonter. Why we hand milk…Hand Milking ensures extra rich milk from stress free happy goats. We milk one goat at a time, allowing for the most caring and sanitary possible conditions. Our cheese is an incredibly complex whole food, complete with digestive enzymes, its own antiviral, antibacterial, and anti-parasitic mechanisms. It is full of water-soluble vitamins, a wide range of minerals and trace elements, all eight essential amino acids, more than 60 enzymes, and CLA—an omega-6 fatty acid. Most of the above are destroyed or reduced by cooking milk (pasteurization) before making cheese. If you have tasted our chevre cheese you know it is unexpectedly creamy and flavorful. Imagine that same fluffy creaminess, but chocolate. We blend our chevre in mouth watering Ghirardelli chocolate then hand dip it in dark chocolate for the perfect decadent combination of chocolate flavor and unmatched mouth feel. Our “Spicy” adds just the right amount of hot cayenne pepper for a modest surprise kick in every morsel. Finally our “Ginger Fig” combines the sublime fruit taste of the elegant fig with just a small bite from the ginger. You’ll be amazed that it’s cheese!